In the first inning, it looked like Steven Wright would get a one-way ticket to Pawtucketville. The knuckle-baller put the Red Sox in an early 2-0 hole again—and it was time for another patented comeback. 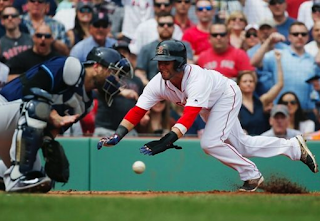 The comeback started in the bottom of the first, when Hanley Ramirez's single knocked in Dustin Pedroia. An inning later, an error gave The Carmine Hose an open door—and they drove three runs through it. Andrew Benintendi had the key blow—a two-run single that put Boston ahead to stay in the 4-3 Patriots Day victory. Meanwhile Wright "knuckled"-down—going six innings and giving up just one earned run for his first win of the 2017. The bullpen was again solid—finishing with Craig Kimbrel notching his third straight save by whiffing the side in the ninth. On to The Great White North with an 8-5 record.